Walmart is an unusually predatory, dishonest and immoral company. The movie starts out with the CEO going on and on about what a profitable and wonderful company Walmart is. Gradually it lets you see the company through other eyes, always cutting back to the corporate propaganda so you can see corporate lies getting bigger and bigger. The movie reveals layer upon layer of wrongdoing, building to a crescendo when you want to run down to your nearest Walmart with a torch and pitchfork. Then they show you some of the successful resistance movement. Walmart pays employees substantially below the poverty line, forces them to work overtime without pay. They pay their suppliers less and less. They drive the entire retail district in a small town out of business. They bust unions. They finagle hundreds of millions in government subsidies. They fob the cost of food and a medical plan off on the government. They squeeze third world sweatshop labour and in the process make Walmart’s owners some of the richest people on earth. 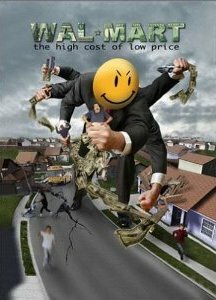 The Walton family seem to be suffering from a monomania — to make more money no matter what suffering it causes, no matter what damage it does to their reputations. The strange thing is these people already have more money than they could possibly spend in a lifetime. They have the same mental illness as Ebenezer Scrooge.